So, earlier this month, i have just had a trip to America. Mainly, to attend my sister’s graduation and also we’re having family holiday. So in this post and the following posts, I will talk about my trip to USA. First post will be… my review about the airline! 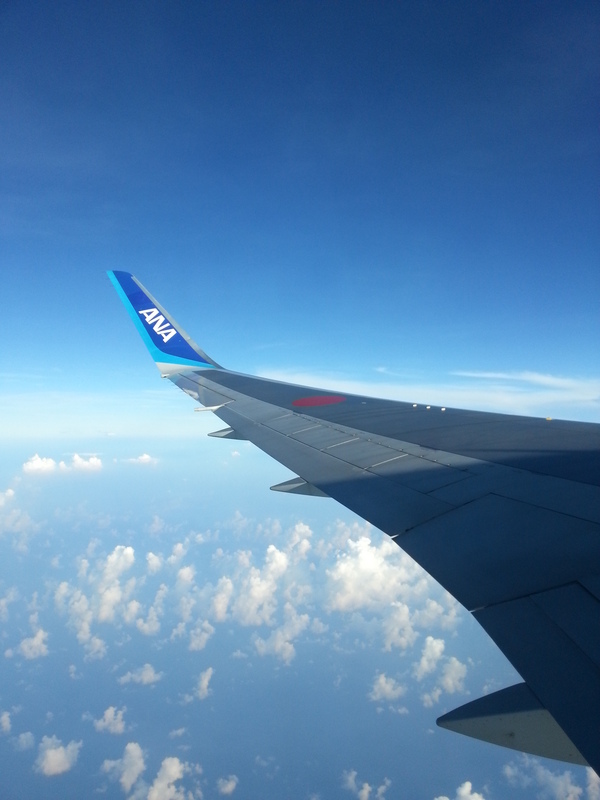 So we went to America by All Nippon Airways (ANA), a member of Star Alliance. Not only we were aiming for the points but also the price was really reasonable. 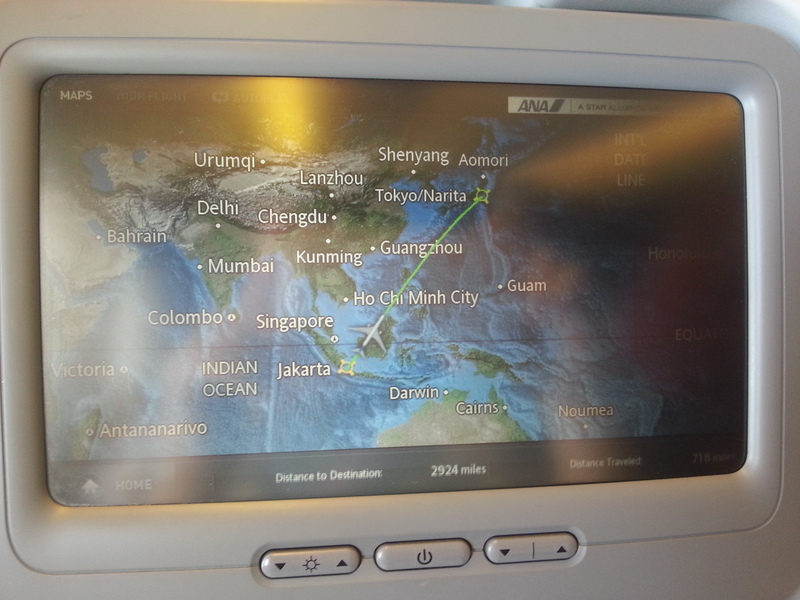 To get to Minneapolis we took route from Jakarta-Narita-Chicago Ohare. From Ohare we continued with United Airlines to Minneapolis Saint Paul Airport. Way back home was much longer. From Orlando we went to Washington Dulles then Narita then Jakarta. It felt tremendously long probably because we were exhausted. So what’s my commentary for this airlines? The cabin crew? They were really excellent. First they were really polite, of course, they’re Japanese. Second they dressed up appropriately. The stewardess are beautiful for sure but It’s a different kind of beauty from Singapore Airlines or Garuda Indonesia stewardess. They are dressed beautifully and elegantly with simplicity that really suits their main duty, serving passenger. For example they wear knee length skirt instead of long tight sarong or long tight skirt like Garuda or SQ’s uniform. They also wore low-heeled shoes instead of high heels. Their make-up is natural and they even wear apron when serving meals. The combinations are just so appropriate. 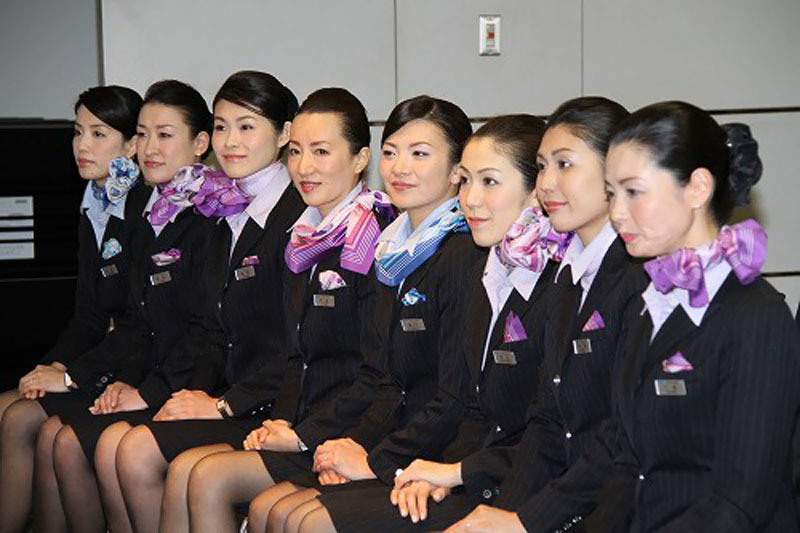 Third, did i mention that all the cabin crews (except the pilot and first officer) are woman? It is so cool! Fourth, they were meticulous! 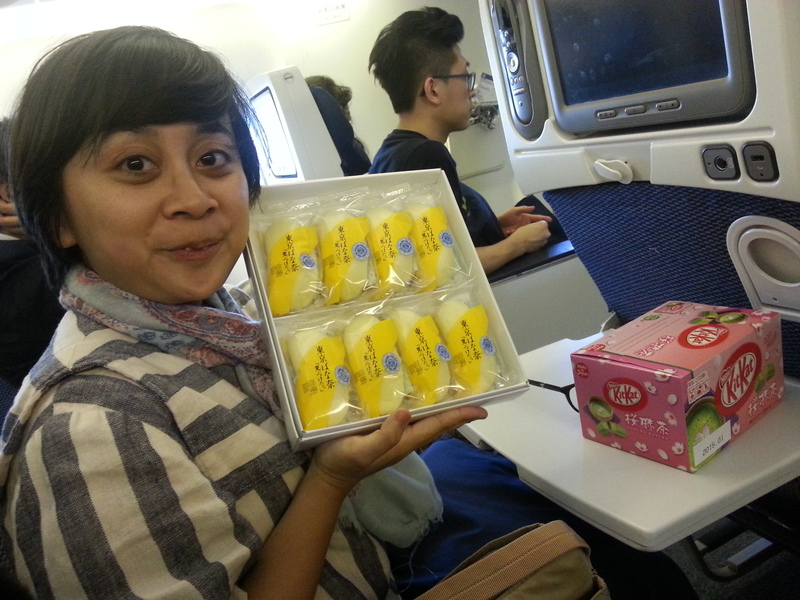 That was my first time to see a stewardess taking such a careful notice of every detail. They even wrote down your smallest order in a pocket book and carefully examine the pocket book when they sit down on their jump seat. Fifth, their English were fine (even though they talked with Japanese to me -_-). 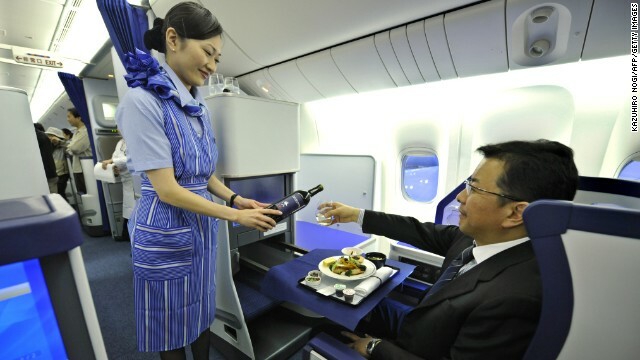 For overall i think i should give two thumbs up for the cabin crew! The airfleets used were quite decent. 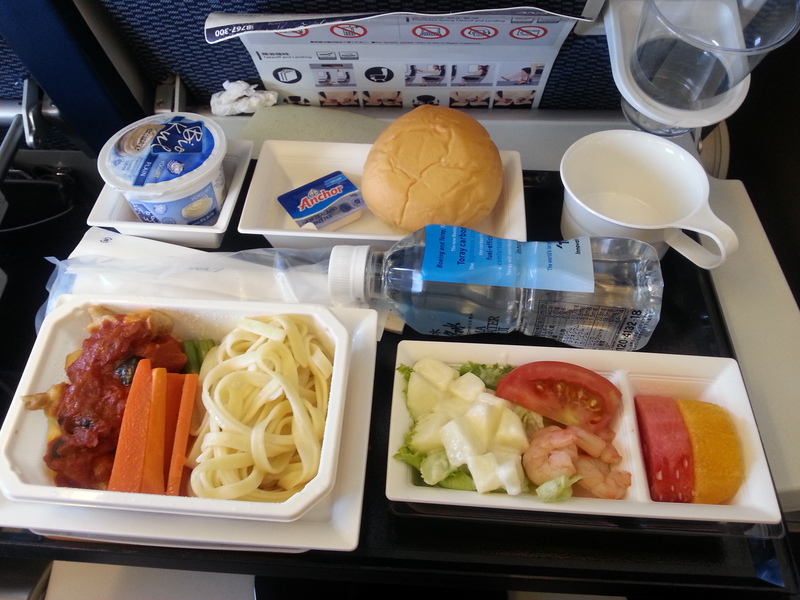 From Jakarta to Tokyo they used Boeing 767-300 ER and for longer haul from Tokyo to Chicago they used Boeing 777-300 ER. These two planes were relatively new. 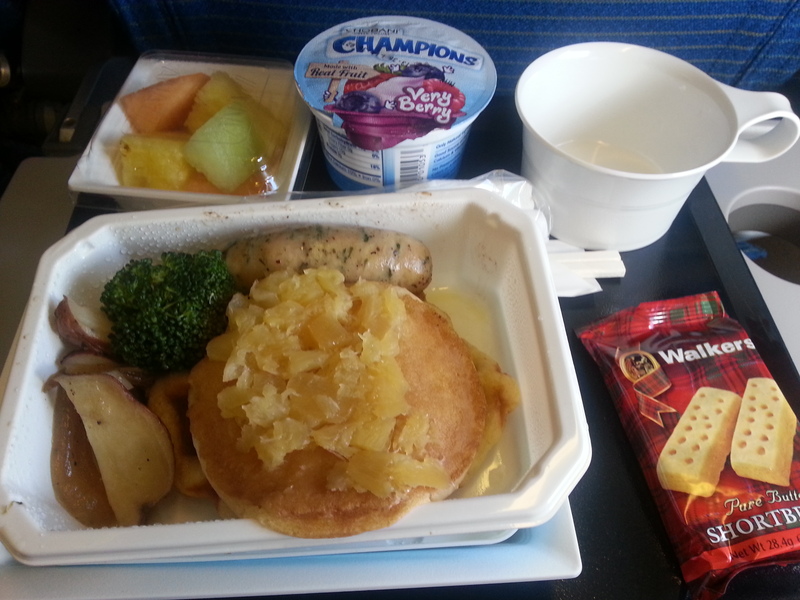 The cabin condition was well-maintained and almost spotlessly clean. The economy class seat was spacious for 145 cm-me 😀 The seats are comfortable, cushions were soft, they have enough leg room, good foot rest, and quite wide aisle. However, the plane that we used from Washington Dulles to Tokyo was quite old, it was Boeing 747-400. I predicted that this plane was more than 20 years old but it was still very well-maintained, clean and no faulty could be find inside the planes. 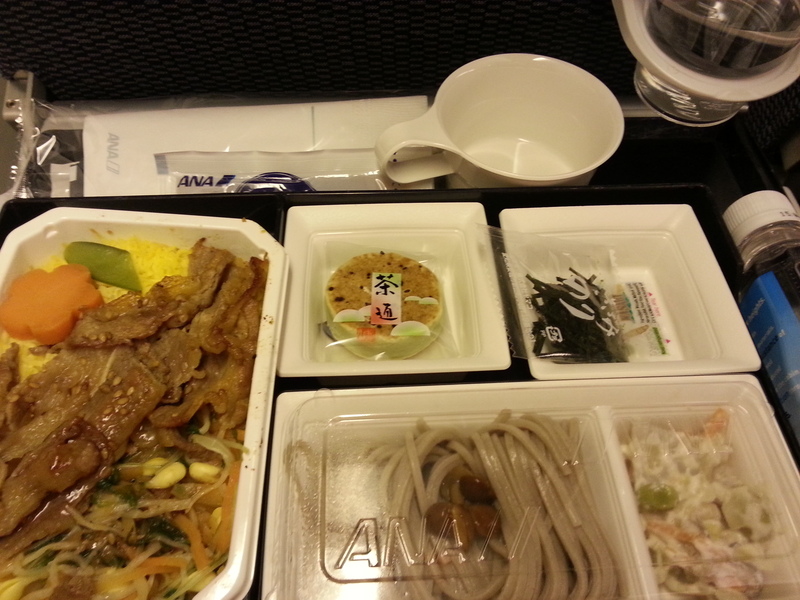 Even the lavatory was cleaner than Singapore Airlines brand-new A380 that i recently rode from Tokyo to Singapore. 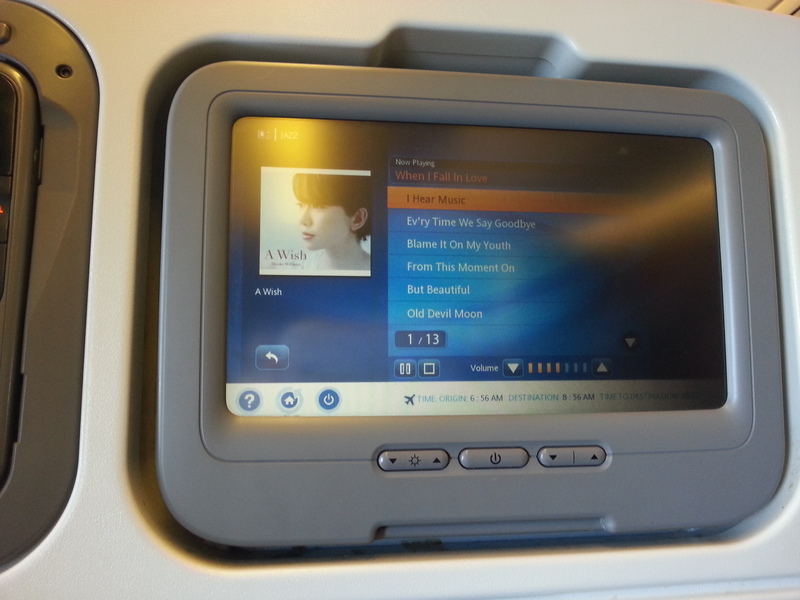 In flight entertainment was decent and I really like it. It’s available in Japanese, English, Francais, Korean, and Chinese. 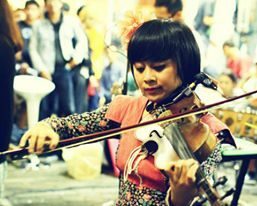 Hiroko Williams, you should check her out, guys! They also had good selection of movies (I watched Frozen (two times), Lego Movies and a good Japanese movie named Calmi Cuori Appassionati, a Japanese movie with Tokyo-Firenze settings. Beside that, they also have a speed learning language program for Japanese and Chinese, but i think it is a bit too fast. They have a bird-eye view camera that enables you to see everything below the plane (like Emirates Airlines), this also includes the take off and landing procedure, which is a total coolness for an aviation geek like me. 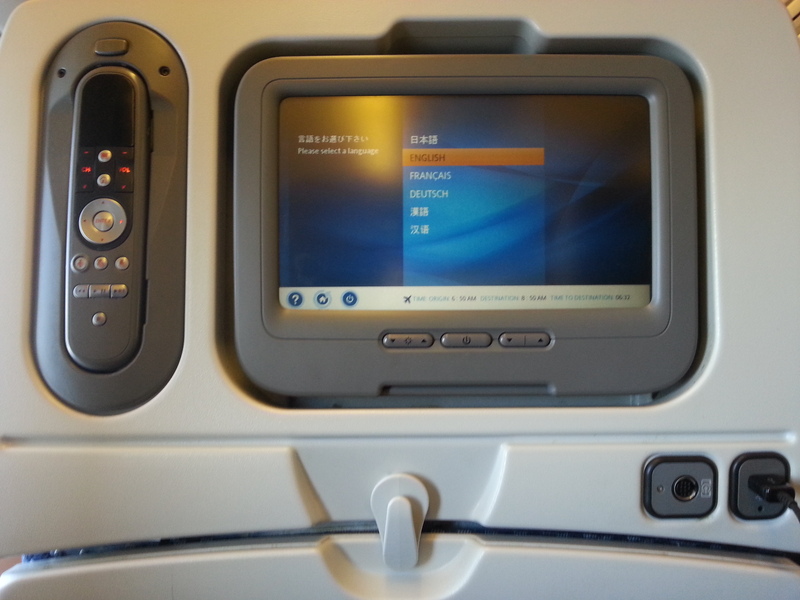 I was really excited to find a USB plug, in which you can connect and play everything inside your gadget’s media player to in-flight entertainment system. However, i could not connect my media player (even though my phone is NTT Docomo, a Japanese made phone). But the plug was still usable for charging, thou. 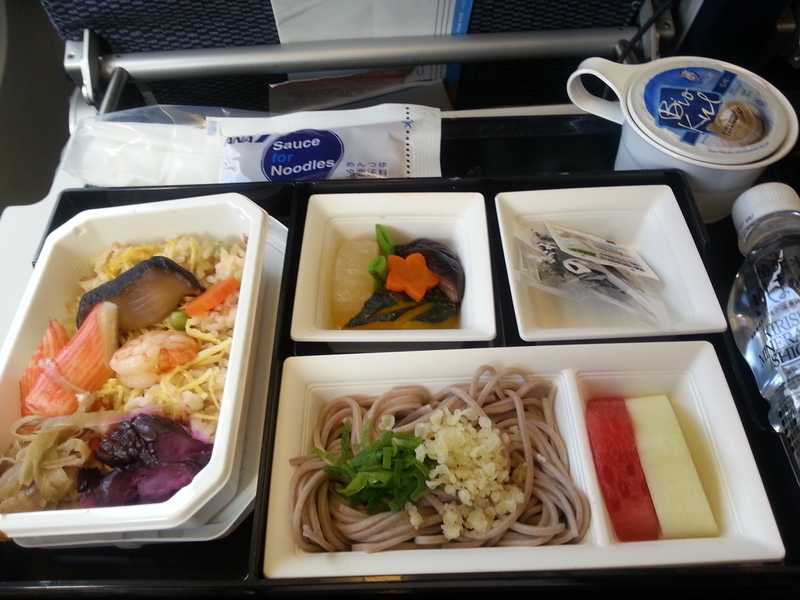 ANA in-flight cuisine, The Connosieur was an exciting palate of food brought to 30.000 feet in the sky! 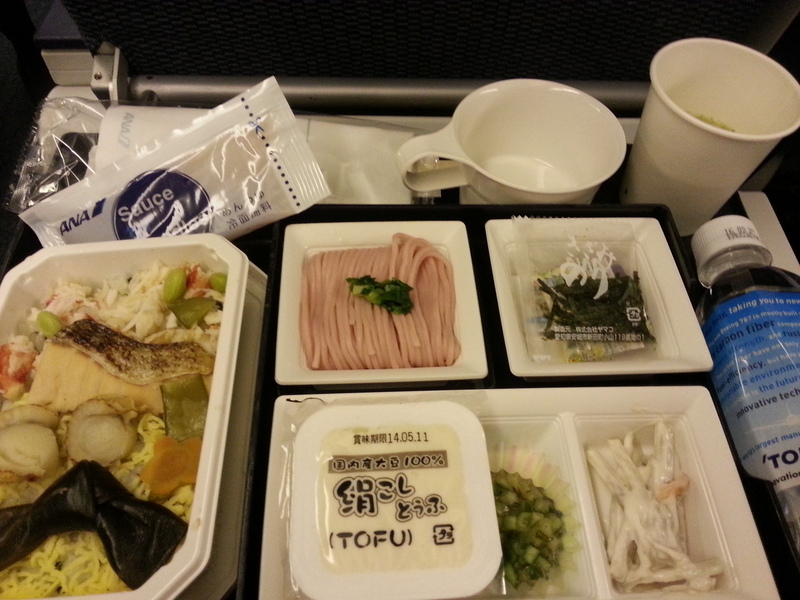 In economy class, we had two selections of menu Japanese and Western. The Japanese menu was much fresher than the Western Menu, but I think the Western menu was also decent. And these are some examples of western menu. In my opinion it was a bit too creamy in some dishes. 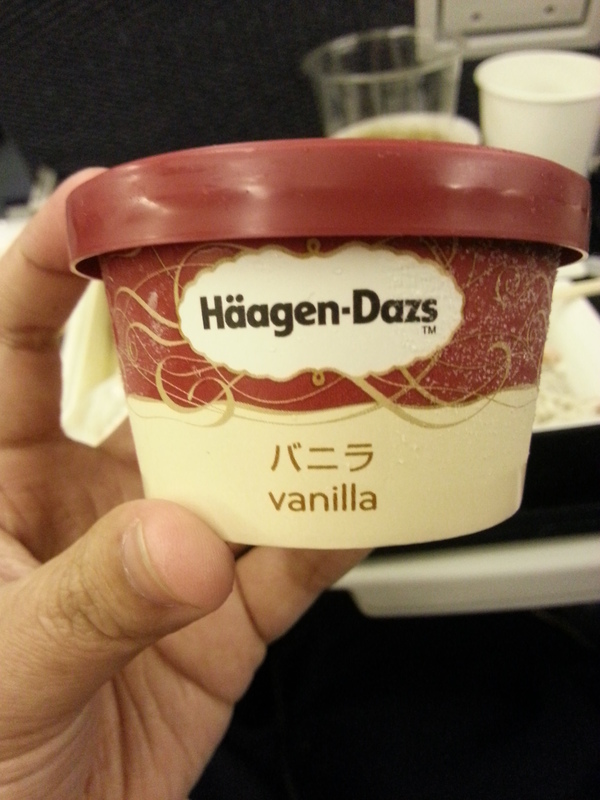 and for the dessert was Haagen Dazs ice cream, hooray!